Doing Business? Looking For Property? Are you planning a Dominican Republic vacation? Making a business trip to Santo Domingo? Or considering investing in Dominican Real Estate? 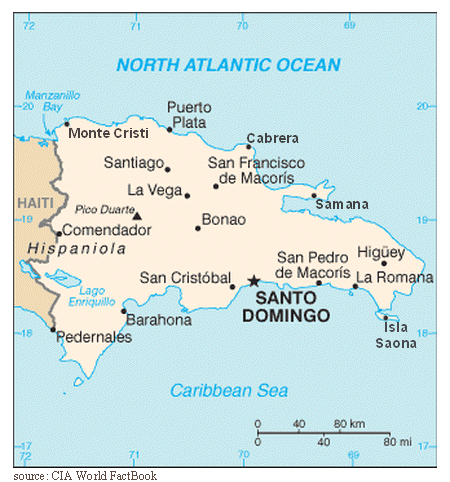 Well, my sister and I were born in the heart of the Dominican Republic, near to San Francsico de Macoris. We spent many innocent wonderful years living in rustic homes and simple communities and we still really LOVE our special island home. Santo Domingo (as locals tend to refer to whole country) is a Spanish speaking corner of the Caribbean, and we have built this website to try and help future and returning visitors to the Dominican Republic to find information quickly and easily and to make the most of a visit to, or vacation in the Dominican Republic – all in one place!. There is a lot of information here, so grab a Dominican coffee, or perhaps light-up a Dominican cigar, and take leisurely some time to browse! Venues to consider when planning a Caribbean Wedding in the DR and the things not to forget to make that special wedding in the DR especially memorable. What it's like at Christmas in the Dominican Republic...such a special time to visit our enchanting island! We know that you will find lots of useful information on this site that you might find useful in planning a perfect visit to the Dominican Republic! 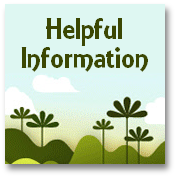 (And if you can't find what you need, then be sure to let us know so that we can add a new page!... Or why not use one of our 'article submission' forms to submit your own Dominican resort review, or other useful Dominican tourist attraction information!)... We invite you to keep browsing our site to discover all that essential information you need to ensure you have an enjoyable Dominican Republic vacation! Help you experience the REAL Dominican Republic we know and love! ...But now you'd like to know the 'inside' information about where to stay, what to see, where to go, what to do...(and maybe what not to do :-D) to ensure you have a truly wonderful vacation in the Dominican Republic! And don't forget that we will be happy to publish any feedback about your vacation in the Dominican Republic, right here on the site as soon as you get back! So...if you are traveling to the Dominican Republic for a great vacation or perhaps on business? Or if you are seeking Dominican real estate as an investment or perhaps for retirement?... Then there has never been a better time to visit Santo Domingo... no matter what the purpose of your trip may be! For any questions about a vacation in the Dominican Republic that we haven't yet covered on the site then please do contact us and we will try and answer your query if we can. If you are planning a visit on business, for work, to seek that ideal 'place-in-the-sun', or simply for a wonderful Dominican Republic vacation - whenever you travel to this beautiful isle we hope that you have a fantastic time, and that you find our site helpful in planning a successful trip. ...And, once again, when you get back, be sure to take a few minutes to post us your Dominican hotel or Dominican Republic resort review, and help future visitors to La Hispaniola plan a great time too! http://www.visiting-the-dominican-republic.com for anyone planning a Dominican Republic vacation, business venture or wanting to relocate a beautiful Caribbean resort! ...Or contact us to request a graphic image link and code and we will make it for you! form whatsoever, without the prior written permission of the copyright holders. Search this site or even the web! The Dominican Republic Weather is Almost Perfect. 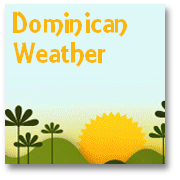 If You are visiting the DR check out our Dominican weather information. Looking for Dominican Republic facts, figures, stats, travel tips and links? Dominican Republic facts and information! Access to travel tips, useful contacts and Government stats here! Where is the Dominican Republic? Here is a Caribbean map! Food of the Dominican Republic? We're proudly Flying the Flag! A favorite Dominican plantain recipe - it's Mangu! When it's Christmas in the Dominican Republic what better than a delicious warming Dominican Republic drink recipe to warm your hearts! Some claim it's an 'aphrodisiac' and maybe more - here is an amusing look at the genuine Dominican Mamajuana recipe for a drink that is sometimes referred to as 'liquid viagra'! Know where to buy mamajuana? Genuine Dominican Mamajuana here! 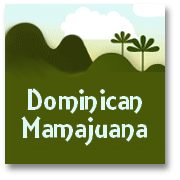 Wondering where to buy mamajuana on the Internet? - HERE is the answer! We want to share with you our favourite best beaches of the Dominican Republic. Samana the town and the Peninsula - get there while its hot! Find suggestions and contact details for hotels in Las Terrenas, Dominican Republic, here! Visit Las Galeras, Dominican Republic, a charming and unspoilt resort... Before it is too late! Altos de Chavon is one of the top Dominican Republic tourist attractions - a must see place of exceptional beauty! Backpacking trip, an excellent way to get to know the 'Real Dominican Republic'! Planning a backpacking trip? Looking for Dominican Republic camp sites, or simple rural Dominican accommodation? Here's the perfect place. Santo Domingo Dominican Republic, an exceptional city to know! Yes, Santo Domingo Dominican Republic has a lot to offer. Come and find out why. Santo Domingo Tour Guide - Know the Real Thing! Property buying tips - Buying a property in a Hot Spot - These tips may help! Dominican real estate deals. Dominican Republic holiday homes and more. Some superb Dominican real estate deals - your place in the sun is more affordable than you think! Looking to invest in a Luxury Caribbean resort? Here are some of the best villas, apartments and land available in a luxury Caribbean resort! Getting around the Dominican Republic - useful information about private and public transport options! Dominican bus timetable, contact information, travel tips - free ebook. Dominican Republic malaria - get the facts not the fiction! In the Dominican Republic malaria can sometimes be a problem, find out what you need to know here. You can also share with us your Dominican Republic Resort review! Is Dominican Tourism Your Business? Do you own a Tourism Business in the Dominican Republic? 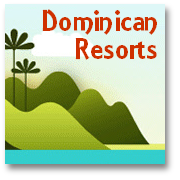 Take advantage of some FREE Dominican Tourism promotion possibilities on this popular website. The 'passion and the pride' of the DR - Dominican Republic baseball, be sure to 'catch' a game while you're there! Kiteboarding videos - Cabarete Dominican Republic and more! Some short kiteboarding videos showing the thrills and spills of the kite board! Then learn to kiteboard in the Caribbean capital of best kiteboarding, Cabrete in the DR! Caribbean Weddings -- Thre are many resorts to consider , but we suggest the Dominican Republic is a fine choice! Visiting the Dominican Republic for some winter sun? Find out about Christmas traditions in the Dominican Republic, it's a lovely time to visit! The Perfect Retirement Plan: Could the Dominican Republic be part of YOURS? The perfect retirement plan - beautiful place, low cost of living, friendly people, plenty to do! Perhaps the Dominican Republic is an ideal base! So just how much money do you need to retire in comfort? How much money do you need to retire in the Dominican Republic - and how can you make it? Here's a few sample of bachata music! Phew!! If you are looking for information about the Dominican Republic economy,t hen click here! What's there to know about Dominican Republic culture? Don't wait until manana learn about the Dominican Republic culture here now! Dominican Republic history - What happened after Dominican Independence? Buy genuine hand-made Dominican Craft items, such as Amber and Larimar jewelry, and more, here now! Dominican Republic larimar jewelry - that captures the essence of the Caribbean sky! Dominican Republic on eBay - Discover the bargains! See the current bargains from the Dominican Republic on eBay! Learn more about the Caribbean vacation paradise that is the Dominican Republic - brilliant full legth video now available here to view F-R-E-E! Looking for a BRILLIANT Caribbean resort - try a Dominican Republic tour! See the sights and sounds of the lovely Dominican Republic - here's a video snapshot of this GREAT Caribbean resort! Why did we build a website? We had a dream to build a website - here is why...and how we did it!! How your small change could help us make a big change. No more ads! Got questions about Visiting the DR? Got advice, ideas & tips about the DR to pass on? Don't miss our Essential Tips for a successful Dominican Republic vacation. 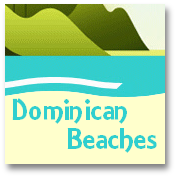 Find a site map for www.visiting-the-dominican-republic.com HERE! The Dominican Republic hosts great beaches, superb hotels, beautiful landscapes, happy people so let your Dream Vacation begin. The Dominican Republic is chosen by thousands for that special Family Beach Vacation!